Our lineup of proprietary stone, tile and concrete sealers was developed by our Sister Company in Texas that has specialized in providing stone care maintenance, cleaning, and sealing services for nearly a decade. 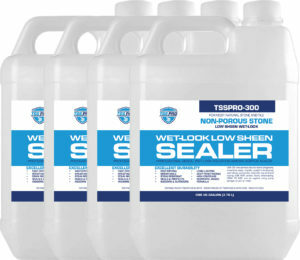 After becoming frustrated with some of the most popular brands of sealants that were “the best”, our team developed the recipe for our first sealant: TSSPRO 100, a multi-purpose stone, tile and concrete sealer. The rest, as they say, is history. The difference between TSSPRO and other big brand sealants is that ours were developed using formulas that we know work, offering protection for years. We’ve painstakingly scraped and chemically removed more poor quality acrylic sealants than we’d like to remember — which is why we started making our own brand in the first place. It just made good business sense for the service part of our business too; how could we offer a warranty for sealing services using a product we know wouldn’t last?